Wow. Completely thorough background, excellent questions raised, give us all much to ponder as we engage and contemplate this potential unprecedented model. It's the kind of thing you want all rockstars and start ups to know about, participate in and learn from....for profits, non profits, all social media users alike. Thanks Beth for promoting this information, for asking the questions and for positing so many more for all of us to consider. This ia a wonderful post, Beth. The self-organizing nature of this project--freedom within a template of sophisticated partnerships--fascinates me. @Susan Strayer - you make an interesting point - how Twitter facilitates the groundswell versus passion for the cause or an individuals passion for the Cause. That's a shift for a lot of nonprofits. @susanmernit - it fascinates me too, but I'm sensing that @amanda is a superb collaborative organizer. Incredibly valuable post, Beth. *Thank you* for tracking the story, laying out the context, and helping us learn as much as we can from these evolutions. You may enjoy knowing that @juneholley, @nurturegirl (Jean Russell), @deborah909 (Deborah Elizabeth Finn), and I have talked recently about starting an initiative -- don't know what it will be yet -- to draw attention and resources to what June calls "network weaving" (she's at www.networkweaving.com). The term refers to both relationship-building (the kind of thing Twitter facilitates, aka introductions and expanding your network) AND collaboration-facilitation (facilitating networked people to work together in new ways to Get Something Done). @igniter (Mike Lewkowitz) is playing with both elements in new ways with ^twitvents, something that's just going through early alpha testing now. I agree, nonprofits will have to change in order to accommodate an independent changemaker sector. What will make that bearable? An alignment of mission among the organization, the independents, *and* those whose interests are being served, often referred to as beneficiaries and hopefully within my lifetime simply referred to as partners, friends. Such an alignment requires a whole lot of communication. All that to say: your documentation is critical, timely, and greatly appreciated. Woops! @lend4health (Tori Tuncan) just corrected me: @igniter (Mike Lewkowitz)'s initiative is ^ventwits. 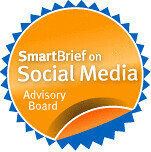 More information at http://www.igniter.com. Beth, thank you for documenting a bit about Twestival. In hindsight, I wish I had kept a daily video or blog of how this has expanded globally. I promise that after Feb 12th I will do my best to tell the full story of how this has evolved. Ben was able to give you a bit of insight into how the original London Twestival formed - but the global reach is much more extensive. I have endless stories of online collaboration, creativity, dedication that I not only want to share, but *need* to share. As you can imagine, managing something under these short timescales, crossing international boundaries, with people who are volunteering out of passion not experience is certainly a challenge. But, it blows my mind to think that there are over 200 cities with dedicated volunteer teams working towards the same goal. This is the heart of Twestival. Beth, this is a super post. Scott Harrison and 'Charity : Water' are simply pushing out the envelope, leveraging the social web, empowering individuals and groups to participate in the brand mission. They are building a Tribe. The new paradigm is disruptive, and for some people uncomfortable. Hats off to Scott and his team for breaking the Staus Qua and taking the initiative to launch, test and learn from new models. It doesn't surprise me that some nonprofits would find this kind of event alarming. It's completely different than anything anyone's done, which is also why it's so exciting. I think charity:water has done an incredible job of communicating with their donors, SHOWING progress and accountability - the end result is thousands of very passionate people that are willing to be fundraisers for you. As the article mentions though, this event was organized in a more thoughtful way than those who questioned it realized. What I wish the article mentioned was how inexpensive this massive effort has been - talk about a low cost/dollar raised! Overall, I think Twestival (and all the articles from blogs to AdAge) is a great wake-up call for nonprofits that are stuck in stodgy ways. Beth, what an amazing post!!! Thanks so much for connecting all the dots on this. One issue that jumped out at me is the fact that leadership and control are now very separate things -- and very difficult things for old-school orgs and leaders to decouple. Decentralization does not, by definition, mean chaos, although it is often assumed to be the same thing. Amanda and her colleagues are very carefully and energetically managing this effort in a facilitative way which empowers local organizers, encourages them, provides tools and guidance while still leaving them with enough enthusiasm and local control to be very effective. This is a great case study, thanks again, Beth, for helping the rest of us to understand the whole picture. Thanks for this great post, Beth! I would jump in to say that I think that like any technique, it doesn't make sense to try to decide whether the technique itself is a distraction or a massive opportunity. Rather, depending on the circumstance and goals and effort put into it, any given groundswell is going to fall somewhere on a spectrum between those two points. So the challenge is not to figure out whether to ignore or jump in, but how much effort it's worth for your organization to try to take advantage of groundswell- like things, based on a solid assessment of what you're likely to get out of it and what else you could do with your time. Great points to ponder! I am looking forward to see how much money is raised. This is a great model to replicate for other organizations. Thanks for this break down, Beth! Does it distract non-profits when churches raise money for them? These are communities just like the communities we see on Twitter. Communities are not new at all--they are just online now. As long as a smaller community doesn't distract from the goals of the larger one, I'm not sure how it would be a detriment. Beth this is a very thought provoking post and this is in itself a great thought provoking set of ideas. My only reservation is that of how do we know that all funds get to it's intended recepient? I guess we won't really know until sometime in the future. As well it is up to everyone involved even just the donors to make sure everything happened as it was intended on a local basis. I also thought David's comments about leadership and random acts was also good food for thought. Thanks for a wonderfull post and I look forward to 2/12/09. Must find the leaders in Atlanta! Thanks for asking me to weigh in on your post. I am glad to learn more about the backstory on how this has come together. As I have experienced firsthand, when you have a goal to do something big, it's amazing how people and resources come together for you. 1. The age of the large scale annual fund campaign and face-to-face fundraising staffs are over - given the increasing interconnectedness of our world, non-profits need to shift their focus more to providing a compelling message and giving their supporters the tools to spread that message. I think you can digitize about 70% of information exchange that used to take place in-person and via letters during the gift request process, which frees your staff to focus their talents on rapport building, gift proposals, and donor stewardship. 2. Non-profits needs to open themselves up for more collaboration with donor evangelists - people who have never given but hear your message will want to help. Let them. Take the barriers and control, so these people (who you don't pay) can be your living, breath brand advocates. The fundraising staff non-profits employ are needed to focus on major donor relationships and interacting with their donor/potential donor community via digital & social media in between face-to-face visits. Your best ideas will come from someone who doesn't work for you and hasn't given to you, yet. 3. While individuals from around the world can raise the money, the non-profit needs to take full ownership of the courageous hard work of putting those funds to good use - when the parties are over on Feb 12, who's going to lead the long, hard march in fixing the problems? The non-profit staff. Who's going to keep the staff accountable? The board. Who's going to the board accountable? Those who gave. 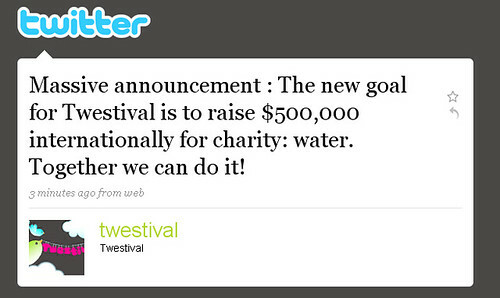 In all, I think Twestival is a good model for other non-profits to follow. Let your donors spread the word and do all the hard work of gathering people. Heck, we've been doing that for years. How many dinner parties, cocktail events, and coffees have people hosted in their homes to ask money for the Sister or Rabbi or food pantry or other great charity? I think the organizers of each city event for the most part understand the importance of offering a way for an attendee to derive personal benefit at the same time their creating social good. It comes in the form of networking with other attendees and the social value that comes from promoting a socially redeeming event. A great example of selfish altruism (we all give because it creates a personal benefit). All in all, I congratulate everyone involved and think it's time for non-profits to realize this is just the beginning.